The #1 New York Times Bestseller (October 2017) from the author of The Da Vinci Code. Bilbao, Spain Robert Langdon, Harvard professor of symbology and religious iconology, arrives at the ultramodern Guggenheim Museum Bilbao to attend a major announcement--the unveiling of a discovery that "will change the face of science forever." The evening's host is Edmond Kirsch, a forty-year-old billionaire and futurist whose dazzling high-tech inventions and audacious predictions have made him a renowned global figure. Kirsch, who was one of Langdon's first students at Harvard two decades earlier, is about to reveal an astonishing breakthrough . . . one that will answer two of the fundamental questions of human existence. Navigating the dark corridors of hidden history and extreme religion, Langdon and Vidal must evade a tormented enemy whose all-knowing power seems to emanate from Spain's Royal Palace itself . . . and who will stop at nothing to silence Edmond Kirsch. On a trail marked by modern art and enigmatic symbols, Langdon and Vidal uncover clues that ultimately bring them face-to-face with Kirsch's shocking discovery . . . and the breathtaking truth that has long eluded us. 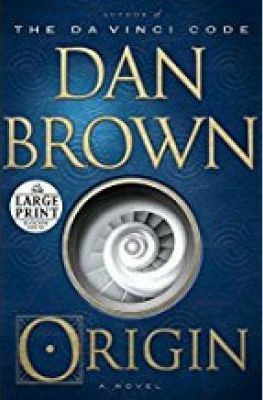 Origin is stunningly inventive--Dan Brown's most brilliant and entertaining novel to date. --People Magazine "A brisk new book that pits creationism against science, and is liable to stir up as much controversy as The Da Vinci Code did. In Origin, the brash futurist Edmond Kirsch comes up with a theory so bold, so daring that, as he modestly thinks to himself in Brown's beloved italics, "It will not shake your foundations. It will shatter them." Kirsch is of course addressing The World, because that's the scale on which Brown writes. Brown and serious ideas: they do fit together, never more than they have in Origin." "Origin asks the questions Where do we come from? Where are we going? They are questions about humanity--but they could just as easily be questions about Robert Langdon. The Mickey Mouse watch-wearing, claustrophobic, always-near-trouble symbology professor is back in Dan Brown's latest book. And just like he was in his original exploits (Angels & Demons and The Da Vinci Code), Dr. Langdon is once again wrapped up in a global-scale event that could have massive ramifications on the world's religions. As he does in all his novels, Brown['s] extensive research on art, architecture, and history informs every page." --Associated Press "The bestselling author of The Da Vinci Code is back with a new book that looks to the future. Origin features many of Brown's signature themes. An evil, Catholic-adjacent cult, in this case the Palmarian Church, is behind some murders. Gems from art history are the key to solving the mystery. [And] if the reader is in it for the thrill and the twist, the faithful will be glad to hear that there's a Da Vinci Code-esque background to Robert Langdon's mission." Dan Brown is the author of numerous #1 international bestsellers, including The Da Vinci Code, Inferno, The Lost Symbol, Angels & Demons, Deception Point, and Digital Fortress. From the Compact Disc edition.